Manufacturing concerns will agree that personnel management and keeping costs to a minimum is key. These aspects were at the fore of a local factory owner’s mind some months ago, while he was fighting to stay afloat in a fluctuating economy. Of concern was the potential inability to deliver on orders placed, and possible retrenchment of employees. Among other factors, it appeared that the wages paid were not in proportion with the team’s performance. An associate of the owner referred him to Active Track, in the hope of it assisting with the management and performance of the factory staff. The owner spoke with Active Track’s sales representative for the area who advised that the GPS and GSM-enabled FPX10 device would be the ideal tool to monitor staff and the wages paid. Active Track met the owner and the management team on-site and trained them on the FPX10 and its web-based support platform. Thereafter, the fingerprints of all staff were loaded on to the device and site-specific parameters were set. For a period of 30 days, each staff member scanned his/or her fingerprint as he/or she arrived at the factory and left at the end of the day. In this way, the time and attendance of all employees was logged. Due to its GSM and GPS capabilities and integration software, the data captured by the FPX10 was effortlessly integrated into the factory’s payroll management system, which ensures that staff are only paid for the real hours worked. This exercise resulted in a reduction of the factory’s payroll, with the added benefit of there being no dispute regarding the reason for the various pay reductions. In addition to a reduction in payroll, management could monitor time and attendance remotely, via the online support platform. In real-time, management could log on to the portal and see which employees had reported for duty and/or failed to do so, and which staff members had arrived late or left early on any day. Daily reports were automatically generated from the captured data and could be accessed via the portal. This tool equipped the owner to take disciplinary action against under-performing staff. 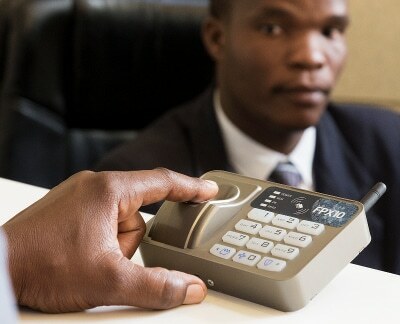 The FPX10 was configured so that management would receive automated email and SMS notifications in the event of breach of the factory’s pre-set parameters, or activation of the FPX10‘s panic or emergency functions. Importantly, the FPX10’s extended battery life of up to 72 hours, portable nature and rugged casing ensured that the unit was always operational and not affected by being dropped accidentally, or by harsh or dusty conditions often associated with the industrial sector. The data captured by the FPX10 is accurate, thanks to the FPX10’s 21-point fingerprint recognition. Similar products rely on a simple six-point fingerprint recognition, which often results in inaccurate data and creates the potential for abuse by users. While the scale of the factory did not require it, larger factories can also utilise the FPX10 to control access to various areas, such as offices and storerooms, by granting certain personnel access to specified areas.